I was curious about Fennec ( Mozilla's mobile browser ) but since I don't own an android phone ( not yet.. ) I couldn't try it out. 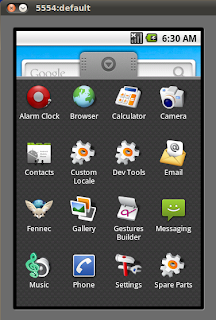 I recently discovered that Fennec can be made to run on the Android emulator, and here's how.. Note: My OS is Lucid Lynx and all instructions are as per my OS. This will open up the Android SDK and AVD manager. 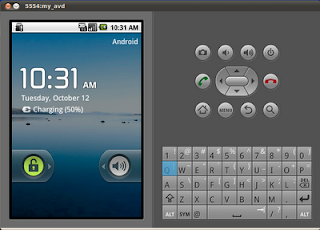 Here you should install the SDK Platform Android 2.2, API 8 and setup a new AVD ( Android Virtual Device ) with it as the Target. now you can run the emulator inside the tools directory with..
check http://developer.android.com/sdk/installing.html for detailed installation instructions. currently available Fennec nightlies wont run on the emulator so you need to build a version that will, by using the correct build instructions in the .mozconfig file. Here's how..
- First download the Android NDK and unzip it in the same location you unzipped the SDK. If you don't already have a mozilla-central code repository you will need to get it first and setup mozilla build requirements on your system. See https://developer.mozilla.org/En/Simple_Firefox_build). - run sudo make -f client.mk inside your mozilla-central repo. - When build is complete cd into the newly created objdir-android folder and run sudo make package. This will create a fenneck.apk file inside the objdir-android/embedding/android folder. The installation will print 'Success' confirming Fennec has been installed on your emulator! Thanks for your post it helps me a lot. "make sure to set the correct paths for the Android SDK, NDK and tools directories"
I really appreciate your hard-work in putting the procedure above. Could you please update the links, I guess those links are old now and doesn't have the relevant information. Fennec is still slow and unstable on Android emulator. 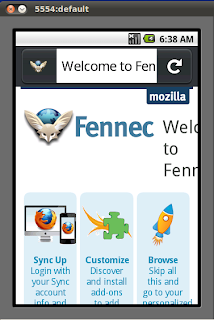 if you know any stable version of Fennec please let me know. If possible provide me the link. hi i am getting this error while building..
Are you running make as root? Try deleting objdir-android folder and running make again. Still iam getting the same error. Can u Tell me where exactly .mozconfig file has to be placed ?. Please give me the exact path. Can you please provide the .apk file which you generated for the android emulator?